When the Dosanj family of Poppadoms: Taste India (Kelowna) announced that they had sold the business and were moving on, I was heartbroken at first. After all, how many restaurants do you know bring an honest farm-to-table approach to Indian cooking? Don’t get me wrong, I enjoy good Vindaloo or Butter Chicken, samosas, pakoras or other fare you find at traditional East Indian restaurants. However, if I have a choice to go to one that elevates that cuisine to a higher benchmark by using ingredients that I know I can trust, that’s where you’ll find me. Couple that with their innovation in taking fresh local ingredients and preparing dishes with an Indian-inspired twist, I’m all in. If I could, I’d attend both. 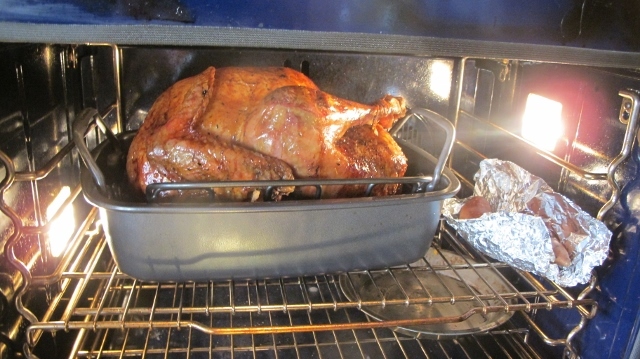 You just don’t know when this cuisine is going to come along again. And I have a confession, for me there’s a bit of a vested interest in the Penticton Pop-Up. After all, when Aman called on me for ideas on where to hold one in Penticton, Cannery Brewing was my first choice. You see I’m a big fan of what Cannery Brewing does as well and I knew Patt Dyck and the ownership team are always open to discussing great collaborations. Cannery Brewing and another of my favourite restaurants Brodo Kitchen have been doing beer-paired dinners hosted back and forth between their locations. It just made sense to bring Poppadoms to Cannery Brewing in Penticton. So I put Aman in touch with Kim Lawton of DogLeg Marketing who works closely with the team at Cannery Brewing and Kim presented the idea to them. I love it when a plan comes together so you’ll find me happily taking in those festivities on Sunday. I was privileged to join Aman for a tasting flight of beer at Cannery Brewing as she planned out the menu. It’s going to be fantastic. If there are still tickets available, check it out. Poppadoms had just celebrated its sixth anniversary December 2015, quite an accomplishment given the family had not been in the restaurant business prior to moving to Canada. I’ve been a big fan since the first day I walked in, and my admiration only grew as I witnessed the thirst for knowledge in all of the Dosanj family. They pursued their quest in so many ways such as joining and supporting the Okanagan Chefs Association, contracting expert advice from such culinary giants as Chef Bernard Casavant, collaborating whenever possible with brilliant chefs and culinary industry folks from throughout the Okanagan, and participating in local events. Aman has big plans to travel the world, explore her own culinary roots and write about it. Jasmin (sister) has already landed a position in Vancouver to expand her wine and industry knowledge. Harry will continue to explore the cocktail movement. Serge (Dad) has been busy with his own restaurant Kettle Valley Plates in Kelowna. Jas will periodically lend Serge a hand and has already scheduled her Poppadoms cooking classes there. The travel agency for whom Jas led a successful culinary tour to India is clamoring for more. And we’re all hoping she’ll take her amazing and samosas to Okanagan farmers markets. I’m excited for the family and wish each and everyone of them the best. I’ve written about Poppadoms in Wine Trails and in my posts in such sites as blog.hellobc.com and myvancity.ca I hope to continue to keep in touch and track the next great steps they’ll take. When a group attempts to railroad in an initiative instead of building consensus about the idea, it drives me crazy when members of that group resort to fallacious arguments. I try to be a good listener and prefer not to go on too many rants so please humour me if I sound a bit preachy. The fallacious argument I hear the most often is the comment when some folks oppose an initiative forced upon them, that those people are “afraid of change” or “can’t accept change”. It’s an attack on the person rather than addressing that person’s argument. Right now, for example, in Penticton the City Council has pushed through a number of proposals that have considerable public opposition. I live in the Regional District of Okanagan South so I really don’t get a vote in city politics despite the fact many of Council’s decisions impact me. I don’t profess to have all the pertinent background details required to make an informed decision. Nonetheless I resent that Council seems to withhold pertinent information and then suggests that it knows better than the average citizen because it has all the facts. Such a comment is as condescending as a parent answering a child’s “why” inquiry with the response “because”. If the proposal is so compelling, why can’t leadership involve the community and get them excited about it? One of these current initiatives involved rezoning a park now used as a sports field so a new hotel could be built close to the convention centre. Quite frankly, a liveable community requires parkland dispersed throughout it – yes, even next to a convention centre. Wouldn’t it make more sense to give existing hotels some sort of incentives to improve? Right across from the convention centre is the aging and frayed El Rancho Motel. For as long as I can remember that land has had such usage. To me, it would make sense to tear that down and build a multi-storied hotel there – maybe even with a plus fifteen walkway across Westminster to the convention centre. Without a valid argument to convince me otherwise that seems logical. I’d rather beautiful the existing ball park even more and make it a jewel within the convention centre complex. Imagine how different New York City would be if city council there kept trading off pieces of central parkland? Yes, I know it’s a different scale: Just the same, green space interspersed throughout a city is desirable on many levels. 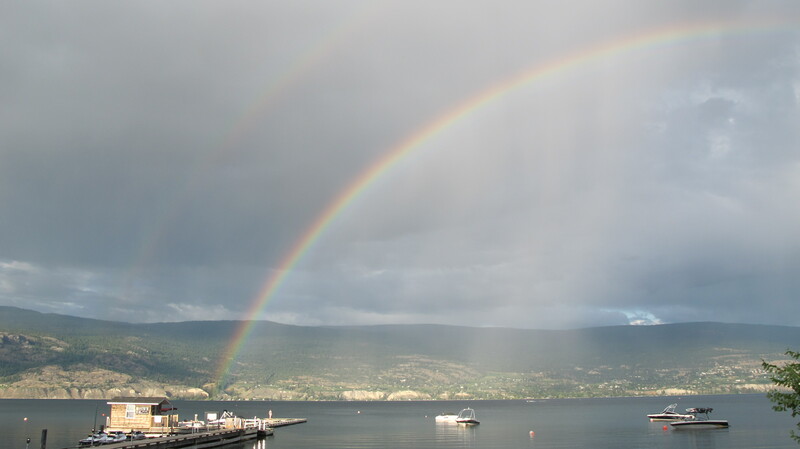 The Skaha Marina project is yet another one where those in power claim to know best. Again, I would say if the reasoning is fair and rational, why not engage citizens and get them on board rather than demeaning those who oppose the idea? And for the record, I am tired of some of the younger and middle-aged folks criticizing the seniors in Penticton for being unwilling to accept change. Excuse me, those individuals over 80 years old have seen more radical changes during their lifetime than the rest of us can even imagine. Of course, there are some people in every age category that are suspicious of change. You will find different approaches to accepting change in all age groups. There’s no need to resort to ageism. To me it makes much more sense to inspire others with the brilliance of your fine ideas rather than to belittle them for taking a critical approach. When the eminent leadership scholar Warren Bennis once said, “Leadership is the capacity to translate vision into reality,” I believe he meant that in a collaborative rather than prescriptive or dictatorial way. There, it’s out of my system now. 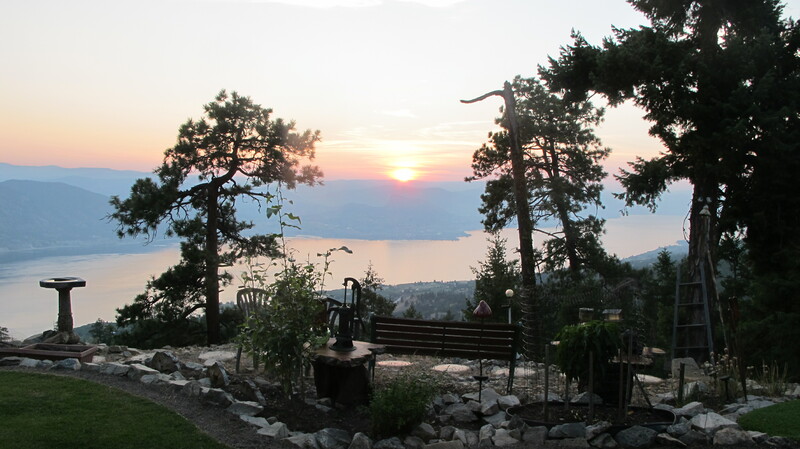 I’ll step down from my soapbox and get back to enjoying summer in the Okanagan. 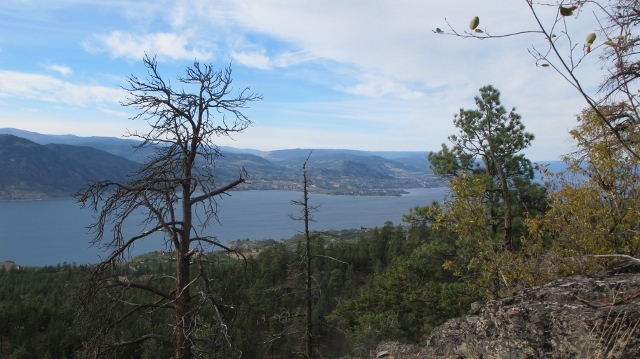 RBuchanan photo: View south over Okanagan Lake toward Summerland, Naramata and Peachland as autumn arrives. Lately when it comes to my personal blog, I’ve been following the first half of Ernest Hemingway’s advice well. However, I’ve not been delivering so much on the second part of his advice to “Live it up so you can write it down.” In autumn though, along with the brisker mornings and cooler nights comes a clarity of thought. Just as the harvest comes in and the golden and red leaves tinge to brown and fall to the ground, your thoughts mature and the old baggage fades to black. 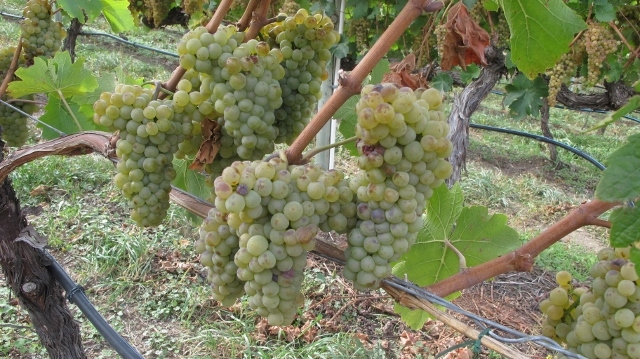 RBuchanan photo: Grapes ready for harvest in Canada’s Okanagan Wine Country at La Frenz Winery http://www.lafrenzwinery.com/ . 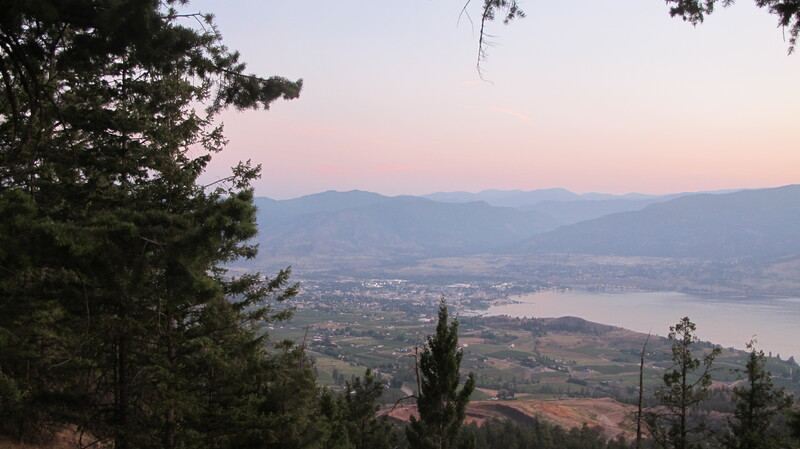 Where I live in Okanagan wine country for many that means the real work begins. I’ll see less of my winemaker friends for a while as they divine those precious grapes into that magic elixir of BC wine we love. I use the word “divine” consciously. It’s not that I think the process just happens rather I appreciate that it takes much more than science to make exceptional wine. The best winemakers are a mix of agrarian, chemist and artist and wear the eccentricities of each in an amusing and delicious symphony. Occasionally I have had the privilege of joining some of the winemakers I know best in the harvest, the crush or some other part of the process when my schedule meshes with theirs. So, I know there’s sweat equity, long hours, sacrifice, a mess on the floor and sometimes heartache that goes into it. It’s much the same for me as a writer. My grapes are experiences, ideas or people’s stories that I want to share. There is a process of growth which varies grape to grape before I can harvest them. Even then as I try to make something special – my wines are words – hard as I strive, some are better than others. Oh, and if you ever saw my office, you’d know there’s a mess on the floor in this labour, too! In my case, that mess is paper, books and research and it’s on the floor, desk and shelves as well. Let me explain there’s a saying that “a tidy office is a sign of a frightened mind” and clearly there’s no fear in my thinking! Thank heavens I live where there are seasons. I feel the change within. It has been a busy season of frolicking on winery tours, reaping the knowledge of others in the Okanagan Food and Wine Writers Workshop, savouring amazing cuisine, golfing an array of courses, hiking new trails, biking pleasant pathways, swimming and scuba diving unspoiled waters and the list goes on and on. Amid all that joy has been deep sadness such as the death of some family and friends. Now it is autumn and I am ready to deal with the best and worst of it all. Tears come easily as I slip back into my routine of neighbourhood walks. My dear friend and neighbour, Claire Festel, only accompanies me in spirit now. 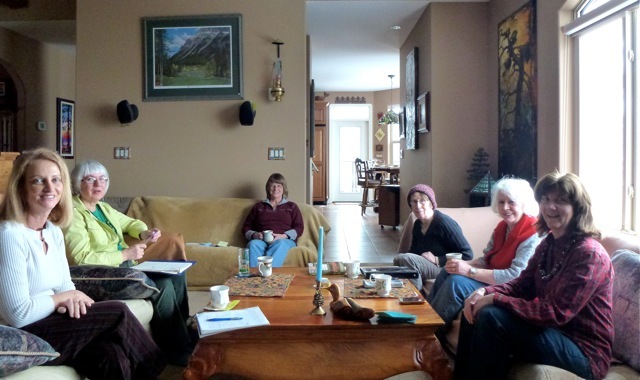 From our first meeting, our discussions revolved around our writing. Knowing her made me a better writer. Along with the talented local author Michelle Barker, she had the idea to form our own writing practice in the style of Natalie Goldberg and I jumped at the opportunity. We often smiled that it became a “group of seven” and we were so fortunate that each and every member brought a special talent and approach that strengthened all of us. My dear and long-time friends Aggie Stevens and Sonni Bone embraced the concept and I also got to know two more remarkable writers, Norma Hill and Louise Devaux. As a Canadian, being part of a “group of seven” holds special meaning. 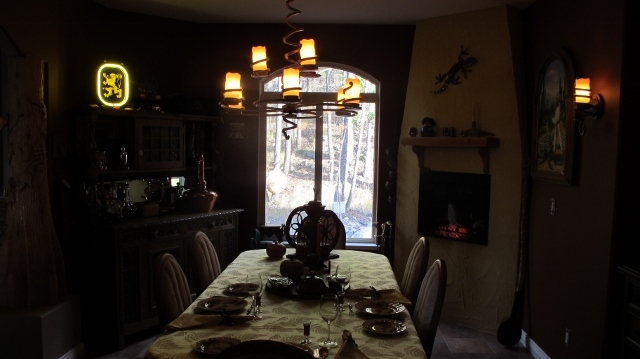 Quoting http://www.thecanadianencyclopedia.ca/en/article/group-of-seven/ as a reference: “The Group of Seven was founded in 1920 as an organization of self-proclaimed modern artists. With their bright colours, tactile paint handling, and simple yet dynamic forms, the Group of Seven transfigured the Canadian Shield, the dense, northern boreal forest, and endless lakes, into a transcendent, spiritual force.” It was our goal to take that sensibility to improve our writing. Through our practice, I know I found inspiration and a deeper friendship of kindred spirits. 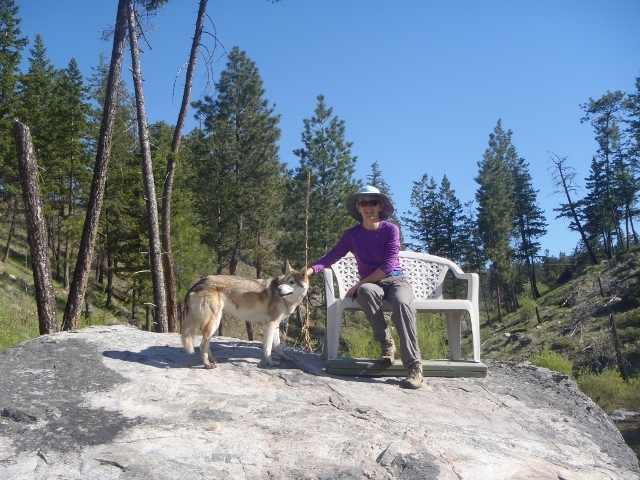 In the end, as Claire’s breast cancer revealed her multiple myeloma and it then gave rise to colon cancer and further complications, our writing practice went into hiatus. Still we walked regularly as our routine morphed into a protocol of Claire phoning me to say she was up for a walk and was I available? I was available as much as possible. Although I knew her condition was terminal, I did not think for a minute that she’d be gone so soon. I didn’t wait for her call as much to be a support to her as to selfishly want as much time together as possible. Yes, I served as listener as she processed the enormity of what she was going through, however, to the last day, we discussed our writing. In this post, I won’t go into the dignity and optimism of her approach to her cancer. Instead I’ll refer you to read Claire’s blog at www.clairefestel.com to let her telling of it enlighten you of her inner fortitude. She died June 9, 2014 and while my husband and I attended her celebration of life and I said a few words that day, it’s only now that I am truly mourning her. Her husband Ed joined Mark and me for Thanksgiving dinner and we had a great evening. 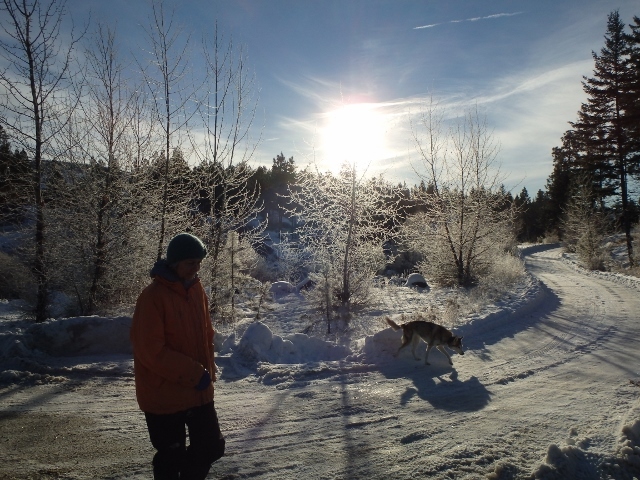 Ed had just returned from another memorial for her held up in Whitehorse, Yukon where they had lived for many years. In advance of Ed’s arrival, I have to admit I worried a little that I would be too emotional because we hadn’t seen too much of him lately. Then I realized either way it would be okay. It is the season to give thanks and to accept that summer is over. 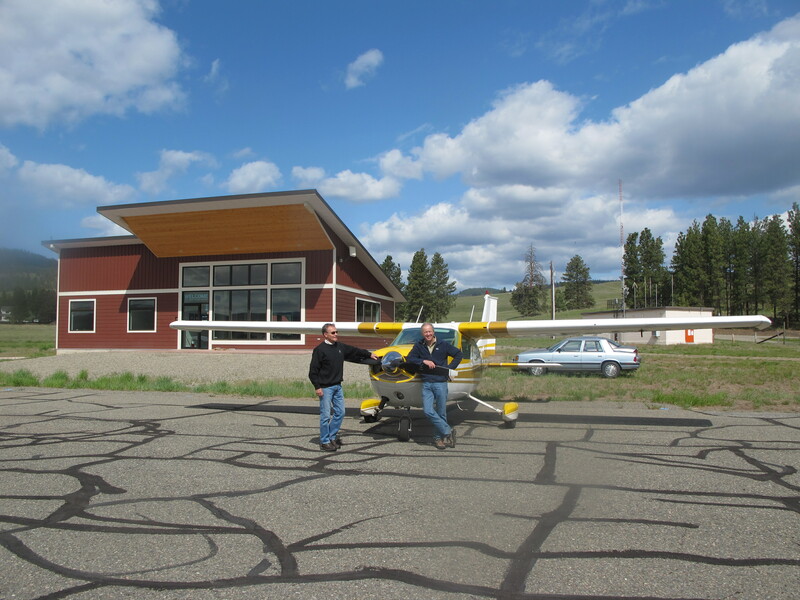 RBuchanan photo: In happier days when Ed took us flying, Mark (left) and Ed in front of Ed’s Cessna at our stop at Princeton Airport. In another post, I’ll talk more of our walks. 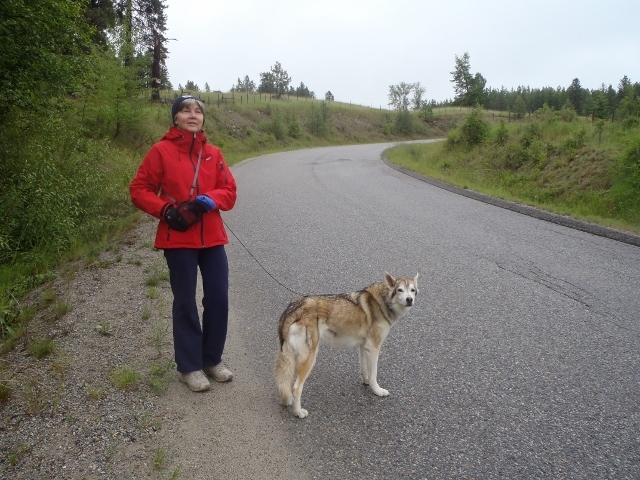 How we both loved nature and how their dog Yukon was such an important part of the routine. I’ll share how much she loved Ed, her whole family and all of her friends. How we’d laugh at goofy moments and occasionally take snacks for the neighbours’ horses. I’ll talk of what a privilege it was to get to know some of her sisters, brother and extended family. 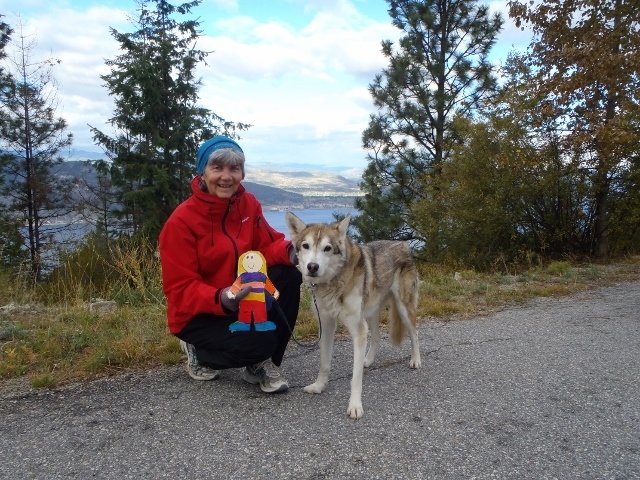 I might even share some of the darker moments when she was terrified by new and aggressive dogs in our hood, when she scolded me now and again, and the melancholy day Mark drove Ed to Kelowna to send Yukon back north. For now, it’s just stage one in my “grape” crush. I’ll shed another tear or two, and embrace my autumn (Claire-ity) clarity. 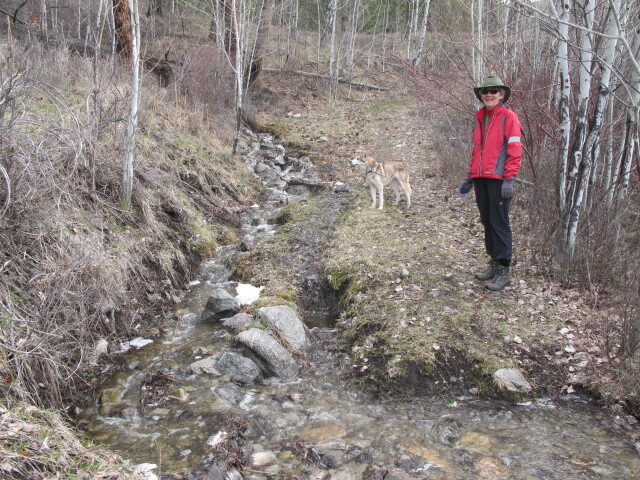 RBuchanan photo: Claire Festel and Yukon on one of our neighbourhood walks. RBuchanan photo: Walking with Claire and Yukon was an all-season routine. RBuchanan Photo: Claire and Yukon pause for a photo. 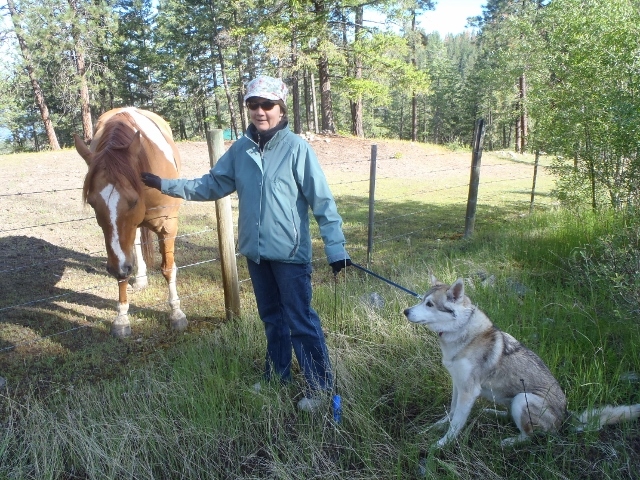 RBuchanan photo: Claire and Yukon visit with our neighbour’s horse. 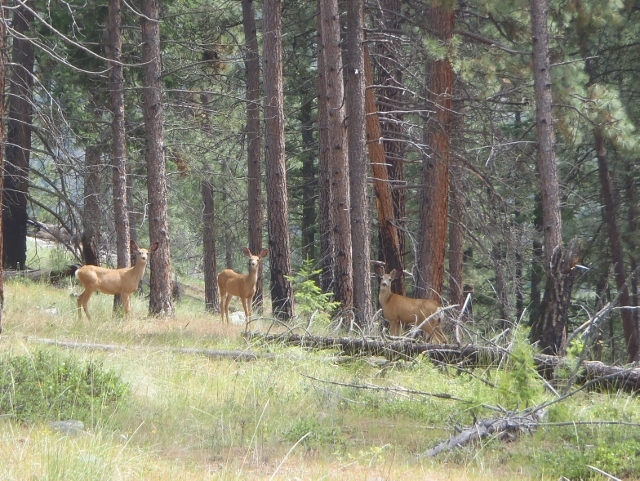 RBuchanan photo: Some of the neighbours we would encounter on our walks. 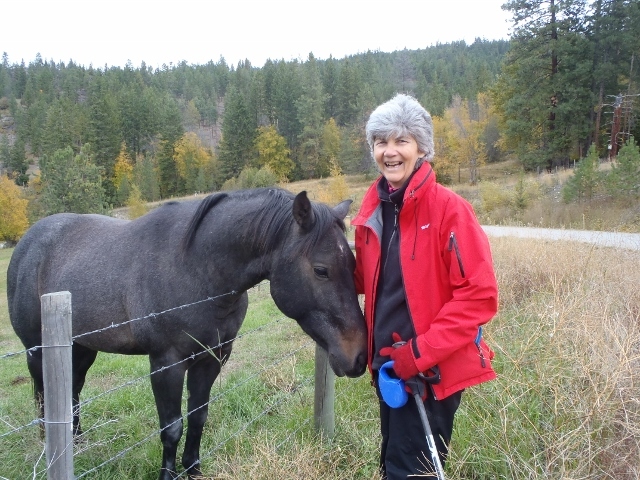 RBuchanan photo: The pure joy of Claire’s in visiting our neighbour’s horses. 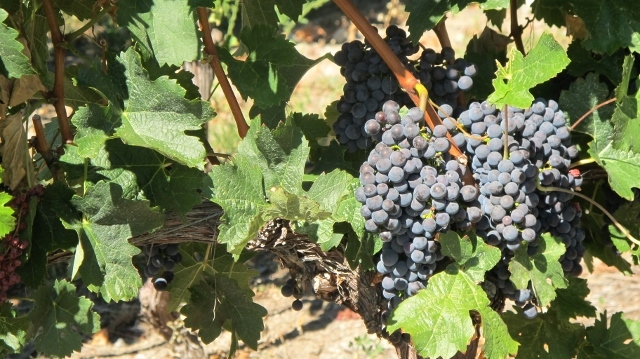 RBuchanan photo: Grapes at Hester Creek http://hestercreek.com/ just about ready to harvest. Join Taste of Yaletown to celebrate its 10th Anniversary in 2014, October 16 to 30.